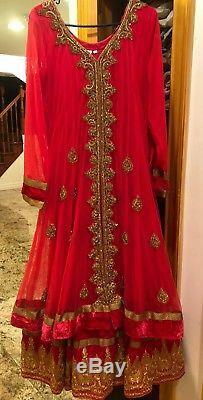 Ruby Anarkali Salwar Kameez - w/ velvet, embroidery, & heavy stone work. 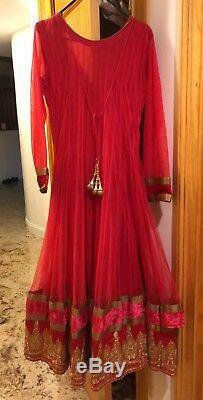 Includes sheer dupatta pictured and leggings. Approximately 56 inches in length with an approximate 42 inch bust. Please message for additional questions. The item "Ruby Anarkali Salwar Kameez with velvet, embroidery & heavy stone work" is in sale since Wednesday, November 7, 2018. This item is in the category "Clothing, Shoes & Accessories\World & Traditional Clothing\India & Pakistan\Salwar Kameez". The seller is "abreen2009" and is located in Roslyn, New York. This item can be shipped to United States.